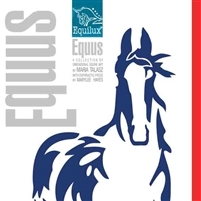 Equus is a selection of dimensional wooden paintings by Maria Talasz inspired by members of the horse family "Equus". In this book you will find color photographs and illustrations of ten individual works of art accompanied by descriptive prose written by MaryLee Hayes. The form of writing is called ekphrastic description, which is the oldest type of writing about artistic creation. Ekphrasis is oftentimes dramatic, stemming from art that is genuinely inspirational. Measures 8"x8", with 36 pages. Made in USA. Charlene's design in the smallest size as a wearable piece of equine art. Measures 2.5 inches wide. Comes in black or white gift box. Equilux 8GB USB Storage Device. Sharp design with crystal handle and custom laser engraved image and solid wood cap. 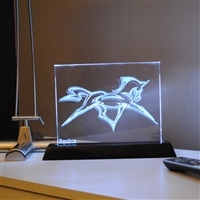 8x10x1/4 inch optical crystal plate with 3D laser etched design inside. Stands on a piano laquered base with LED lights. Majestic Denali, tallest peak in North America with Wonder Lake in the foreground. Jumping the mountain range is the famous Magic Milton. A dynamic play of positive and negative space form the trees of the tundra surrounding the lake. Fall colors with gold paint provide a warm contrast to the blues of the mountain. The segments are strung together to form the landscape in combination with the back panel.